The Sabbath Silk Route is a load lugging all-rounder that creates its own niche by using a titanium frame. Thoroughly practical but we suspect most buyers would prefer to start with a frame and make their own component choices. Titanium framed touring bikes are a rarity, probably mainly because they tend to be regarded as a luxury in the relatively traditional world of pedal powered haulage, but also because most of the big name titanium frame builders tend to demand a higher premium for their wares than British company Sabbath. Based on a £1199 frame (some outlets include the fork at that price) this complete Silk Route shows that a titanium-framed tourer can be had for a UK average month's salary. The Silk Route is a fairly recent addition to Sabbath's range, which has been slowly evolving over the past six years. The frame is designed in the UK and built overseas to keep costs low. It's nicely designed and well finished, with a practical blend of plain gauge tubes biased towards luggage hauling durability rather than minimum weight. 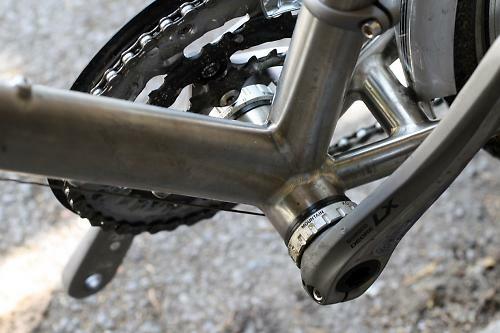 The frame on its own weighs 3.65lb/1.65kg (size dependant), which is fairly hefty for a titanium frame, but the resulting stability in ride feel when loaded front and rear is precisely what's required on a bike like this. If you're not looking for a haulage bike you should probably look at one of Sabbath's lighter, butted-tube models. All Sabbath's frames use the well regarded 3Al/2.5V drawn tubes (the figures refer to a 3% aluminium, 2.5% vanadium mix in the titanium alloy). There are six models in the range covering racing, touring, everyday or sportive use and the racy models use lighter butted tubes. While the Silk Route is designed for touring, its long wheelbase, easy-riding geometry, Surly steel fork and big tyre clearance make it suitable for steady trail use as well as ideal for rough roads. There's enough room for 38mm tyres if you feel a need for bigger treads than the 32mm Continental Touring Pluses fitted, and the 36 spoke wheels with Mavic 319 rims and Shimano LX hubs can take a fair bit of punishment. A Brooks B17 saddle is a nice touch on a bike like this too, and a reminder that Brooks' saddles, while not light, are still among the most comfy seats around. There will be riders who'll baulk at dropping £2199 on a Shimano LX/105 level bike with a workmanlike steel fork, trouser-guard equipped crankset and middle of the range finishing kit, but if you're attracted to the idea of your new bike being based on a titanium frame you'd be hard pressed to build a rack and mudguard equipped tourer with decent wheels and a Brooks leather saddle at this price. You can remove that trouser guard if you don't like the look of it and Surly's steel fork is fitted because it's one of the best off the peg touring forks on the market, with threaded eyelets for every rack type and the sort of stability, combined with the thick plain gauge steerer tube, that justifies its relatively high weight. Handling was rock solid, even riding hands free with front and rear loads. We're not particularly recommending this but it's a great way of testing stability on touring bikes and a great way of getting your loads spread properly assuming the basic geometry is fine. Another good front end stability test is being able to brake hard without fork flutter with an outer cable guide mounted on the upper part of the head tube: many bikes with cantilever brakes need the cable guide to be mounted on the fork crown. The Silk Route could be an ideal starting point for riders who like the idea of owning a utility rather than race focused titanium frame. But we can't help but think that most of those riders would prefer to make their own parts choices. A few of the parts on the Sabbath just don't look at ease on a £2000+ bike. But that's probably missing the point. You could find yourself paying this much for a frame alone from some of the more established titanium frame brands, and you're still getting a tough maintenance free frame that won't rust. All Sabbath framesets can be built with different component parts and custom finishing options so the details on our test bike are not set in stone. Its 'bright brush' titanium finish with subtle, almost invisible, sandblasted graphics is practical, and part of the appeal of titanium is that it'll buff up like new year after year. Tubing shapes of the Silk Route include curvy rear stays for extra heel clearance, a biaxially ovalised top tube for lateral rigidity plus big weld contact areas at the seat and head tube and an oversized, ovalised down tube. All the tube profiles are said to be designed to improve stiffness and stability when hauling loads, and our ride experience bears this out. 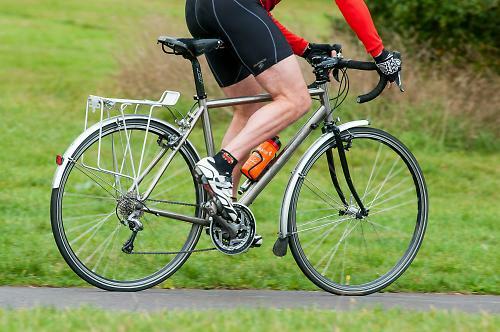 Long chainstays ensure that panniers stay clear of your heels, and Sabbath say it's built to carry up to 35kg: the test bike rack, a fairly basic Tortec model, is limited to 25kg. There's are three sets of bottle cage bosses (one set underneath the down tube) and threaded rack mounts, all welded rather than riveted into the frame, and in keeping with the traditional touring bike approach there's even a pump peg on the head tube for a frame sized pump. 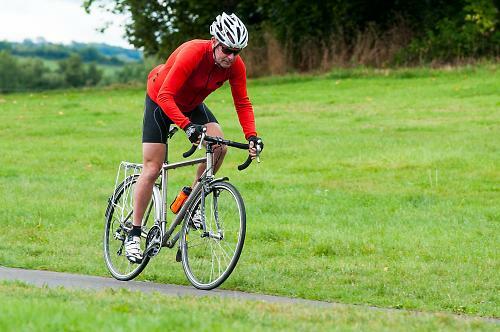 Our test bike weighed in at almost exactly 28lb/12.6kg without pedals. There is masses of bar/stem height adjustability and in addition to the components we've already mentioned the finishing parts included a standard Shimano LX touring crankset (with removable trouser-guard), 105 3 x 10 gear mechs and 105 shifters, Pro seat post, stem and compact handlebar, SKS 'guards and LX cantilever brakes. The gear range was more than adequate for the most mountainous terrain, the wheels were well built and the geometry and riding posture emphasised comfort and stable control at both low and high speeds. The head angle on the medium frame is 71.5 degrees, the seat angle is 73.5 and the horizontal top tube length is 56.5cm, with a 54cm (centre to top) seat tube and a 15.5cm head tube. Don't expect a sturdy long wheel base bike like this to feel as lively as a steep angled race bred model. Snappy acceleration or sprightly handling will never be highlights, even if you strip the touring gear off and fit skinnier treads. But there's something incredibly soothing about a bike like this once you've got it up to speed, with big sweeping turns on long descents being a real highlight. That said, slow speed traffic riding is also incredibly confident, with the long front centre meaning no mudguard toe overlap if you make sharp turns. Our month of riding uncovered no unpleasant foibles, loaded or unloaded. 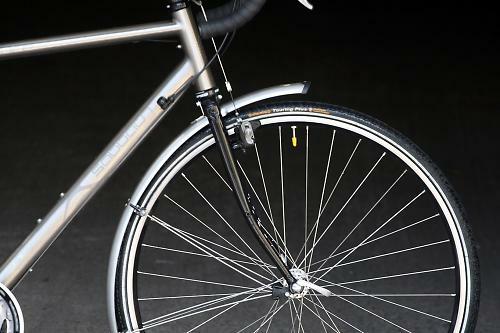 A thoroughly practical titanium touring bike, both utilitarian and potentially superior in durability to the traditional steel framed approach and more comfy than most aluminium framed options. Most riders would probably start with a frame alone and equip it to suit their particular needs. A classic touring bike in style and function, but it would obviously double up as a sturdy everyday commuter or weekend rides bike. 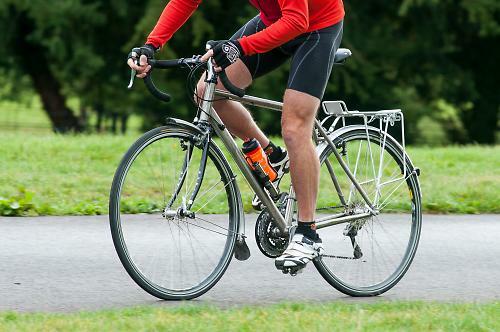 A long front centre keeps things dead stable with luggage and your feet clear of mudguards. Depending on the stem you choose, the Silk Route has a efficient flat back stretch for climbing and cruising but it's more stable and less lively than some. It's hard to know how much comfort comes from the frame and how much from the tyres. Plain gauge titanium tubes certainly don't offer the same level of shock/vibration absorption as lighter butted tubes. But with touring tyres fitted this doesn't really matter. Yes. Particularly impressive front end stiffness when carrying luggage. No. Loads of room, even with mudguards. How would you describe the steering? Was it lively, neutral or unresponsive? Incredibly stable. Stability is to the fore, to a point where the steering almost feels heavy if you've been used to a more lively lighter steeper head angled bike. Brooks B17 saddle was a nice comfort reminder of why Brooks leather saddles are still popular with long distance riders. A 28lb bike is never going to be rapid in acceleration. Super stability, with or without luggage. Very confident in urban traffic. 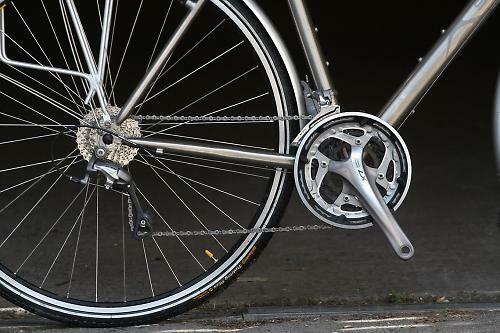 Wide range of gearing more than compensates for the weight. Shimano LX has a good reputation for durability. Trouser guard on the crankset is removable. If you're not hauling luggage lighter tyres would liven up the handling slightly. You can choose whatever parts you prefer at the point of purchase. Would you consider buying the bike? No. Would you recommend the bike to a friend? Possibly. 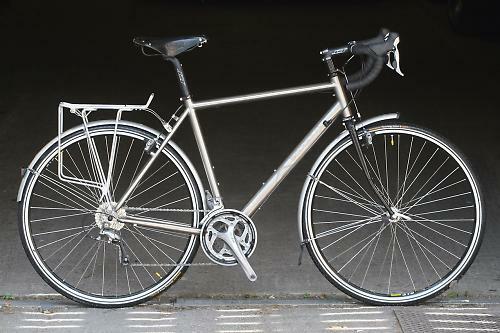 Regardless of everything else, the idea of a long haul touring bike that doesn't rust is very appealing. On the other hand, if something does go wrong then it's not easy to find a frame builder who can repair titanium.